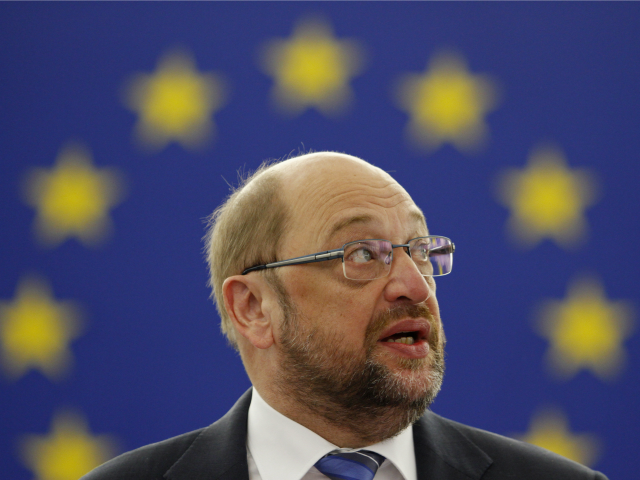 “I want there to be a constitutional treaty to create a federal Europe,” Mr. Schulz said Thursday during a speech at a Social Democratic Party of Germany (SDP) convention in Berlin. He told members of the party, which he leads, that the EU should rapidly expand its power and erode the sovereignty of nation-states, and that any country standing in the way must be ejected from the bloc. According to the Financial Times, he insisted: “Such a constitutional treaty has to be written by a convention that includes civil society and the people. “This constitutional treaty will then have to be put to the member-states and those that don’t approve it will automatically have to leave the EU,” Mr. Schulz explained. “If this is the route they are taking, it could be a very small European Union. #ThankGodWeAreLeaving” added Brexit campaign leader Nigel Farage. The EU has already attempted to effectively implement a constitution several times, with treaties scrapping vetoes, creating new EU instructions, and taking control of policy areas. Each time, they have been met with democratic resistance, before resorting to undemocratic means to expand their power. In 2005, France and the Netherlands voted against the “European Constitution”, before it was repackaged and renamed as the Lisbon Treaty to avoid further referendums. Ireland voted against both the Treaty of Nice, in 2001, and the Lisbon Treaty which revived much of the European Constitution, in 2008. Each time the Irish people were forced to vote again until they accepted the EU’s power. After Brexit Mr. Schulz’s plans may stand a greater chance of being realised, with Britain having generally opposed EU federalism.